Curren$y (aka Spitta Andretti) and Fraud previously connected on Cigarette Boats, an EP they dropped in 2012 as a Sound Cloud only release. The Marina sees their chemistry is still as sharp as ever, with each artist lending what we think are career-best efforts. 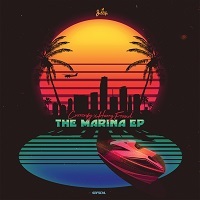 The Marina is a showcase for Spitta’s understated, but clever brand of lyricism. Mr. Fraud also delivers, crafting a soundscape as dynamic as Spitta’s subtly versatile flows. The chemistry between the two would make Walter White envious. The show begins with “Radar Tower,” a dreamy opening for a project filled with gems from Fraud and Curren$y. “Yours truly in the booth, packaging and wrapping these bricks/My style capture a chick, she was dressed quite ravishing/In the parking lot at the Radisson/With garbage bags of cash in the back of the van,” Curren$y raps, tying in some nice alliteration while sounding as relaxed as can be. With additional tracks featuring heavyweights like French Montana, Action Bronson, Smoke DZA and Wiz Khalifa, this release is certain to become an instant “must cop” release.